A DIN rail that can be cut to size. It facilitates both procurement and installation. Hole pattern Hole pattern 18 x 5.2 mm. Galvanized steel DIN rail with and without hole patterns. 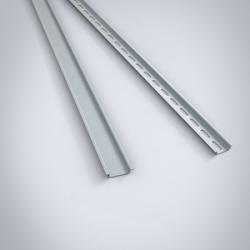 The DIN rails are supplied in lengths of 2 metres allowing customers to cut them to size in order to install modular components. Modular components can be easily installed in a fast way onto the enclosure's mounting plate reducing the required mounting time .